In case you've missed it, the last month of my life centered around completing the Whole 30 way of eating. You can read about my journey: Day 1 and Day 10 and Day 20. As I reread those posts, I remembered where I had been just a month ago. I remember how lost and out of control I felt. I remember how impossible 30 days looked from day 1--how I mourned the loss of diet Pepsi and simple carbs and sugar. That monkey had such a hold on me, and I knew that something needed to change in my life. Those first ten days were so hard. "Fake soda"--a splash of fruit juice in Pellegrino. The hours in the kitchen and grocery store. The withdrawal side effects--headaches, sleepiness, grumpiness. The next ten days had their own type of hard, but I began to see some of the positives--finally. I could see the beauty of a well plated dish--the interaction of the colors and flavors. I found a tiny bit of satisfaction while cooking. The recipes became familiar and the shopping less dreaded. Soda didn't beg me and carbs didn't call me. My strange eating rules were becoming habits. I have to cop to one unconscious slip: I ate something off plan while we were helping for our stake's Pioneer Trek, and after I finished eating a piece of corn bread (yeah--not even anything awesome or worth cheating for), I was devastated. How could I do that? I beat myself up pretty bad about it. Then I moved on. This extreme side of Whole 30 is one thing I really don't like. Guilt from corn bread? Seriously? So, how did the last ten days go? One of the weirdest and hardest parts of Whole 30 for me was my complete lack of interest in exercise of any kind. I've always loved exercise, and yoga has been an integral part of my life for the last few years, but I couldn't muster the energy to bike or get on the mat for the first three weeks. By Day 22 or so, I was finally feeling like I had enough energy to exercise and recover from it. Some days I still don't think I have enough energy to exercise, and I need to find a way to compensate for this, because I've missed exercise. I maneuvered two family reunions and two trips out of town by taking coolers of food with me. I hated that. This is another aspect of Whole 30 that I really hate--just living and eating and interacting normally during meals or social activities. My last formal day of Whole 30 was June 10th, and as the end of the experiment approached, I began to panic. What would I do when I no longer had to follow all of the rules? Through the entire process, I told myself that there was NO WAY this would be permanent in my life. After 29 days, I was beginning to rethink my resolution. Day 30 came and went with little fanfare. I evaluated how I felt. The cravings had all disappeared. My clothes fit better, and so did my skin. I felt stronger and leaner. Brad commented often how different my hair looks and how clear my skin is. I had learned how to cook a little bit--and by the end of a month of it, I didn't hate it so much. I don't think I'll ever end up on Iron Chef, but I'm not an embarrassment with a garlic press any more. Before Whole 30, I didn't take time to understand how my body responded to hunger, but that changed. Before, I didn't think my body cared when or what I ate. After 30 days, I learned that my cravings spike when I don't eat regular meals that are balanced and filling. If I missed a real lunch, then I was a mess by 3 pm. If I ate a good dinner, I didn't need "just a little something" sweet before bed. If I ate a real breakfast, I was good until lunch. I don't think I'd ever consistently eaten "three square meals a day" (and only three meals a day) in my entire adult life. This alone shifted my eating paradigm completely. On Day 31, I woke up and stared at the ceiling for fifteen minutes. It was judgment day. I felt great, but what would the number on the scale say? Did it matter? Would a negligible change reflect that I had failed? I had to steel myself--like I used to when I was pregnant and I knew I had to face the scale at the doctor's office every month. I got on the scale for the first time in a month, and it said I had lost some weight. Funny thing is, that number didn't matter as much to me as I thought it would. That is progress. I like cooking. A little tiny bit. I like good food. More than I thought. My family likes it, too. Today is June 17th. What has a week off Whole 30 been like? In all honesty, I haven't gone off the plan. I know. I was shocked, too. I'm a little afraid of how my body will react, truthfully. I don't like that feeling, either. I had real ketchup one night, and I had a juice popsicle (with sugar in it) one 113-degree day. Those choices made me think, and I had to determine if the choice was worth it. More mindful, baby steps, which is good. Then, I had cheese and tortilla chips on Saturday (way more than I should have), and within an hour, I was feeling bloated and crappy. Will this be the rest of my life? Will I be unable to eat food like normal people? That was not the goal going into this whole thing. I don't want to be a prisoner of rules and strict control and panic over possibly hidden sugar grams or white flour. I don't want to never eat a chocolate chip cookie or pasta or a grilled cheese sandwich. I don't want to eliminate popcorn and soda when I go to the movie. I like that, and food is supposed to bring us occasional joy, along with fueling our bodies. My long-range goal is this: I've always wanted to be a person who can eat one or two cookies, and then STOP. Eat a normal plateful of food, and then STOP. Drink a soda every once in a while, and then STOP. I hope that's possible. I think that Whole 30 has taught me skills and cues that will help me achieve this more mindful way of eating. From here, I realize I still have a long way to go to reach that goal, but with baby steps away from the strict plan and mindfully addressing how I feel after eating, I think this is the beginning of a permanent change. 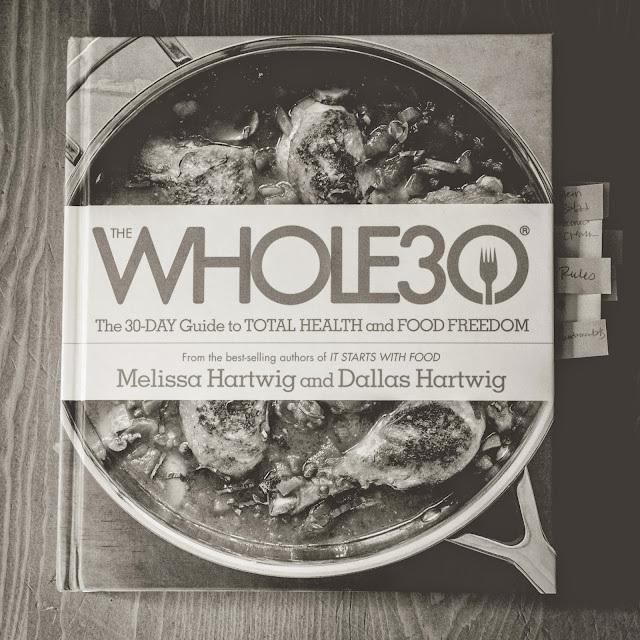 CONGRATS on completed WHOLE30! It is such an incredibly hard process but you learn so much and I feel its' so worth it. We just completed our second and I really didn't want to go off script again because I hate the crappy feeling I get when I eat bad food. I am like you too, though, where I don't want to be a prisoner to a certain food group just because. I have a goal in mind and once I reach it I think we will eat 80/20 Whole30. WELL DONE! Coming off sugar is a beast. You did a great job! I'll have to check this out, it sounds great. I was rather forced into my diet change because I am tired of pain, but it still hasn't been easy. I am applauding your efforts - well done! One thing I have noticed: although I havent really lost significant poundage, I kept having people tell me that I was looking thinner. This was puzzling until the other day, when I realized I'd been wheat-free for almost 3 months. I had lost the bloat! And it's true - my core is so much leaner. That, coupled with next to no sugar, and no soda (which I do not miss, by the way) helps me feel and look better! I still get cravings for a cookie or piece of cake, but I am learning to make them myself gluten free and vegan (I cannot have gluten, diary, or eggs) - and it's amazing what a help Pinterest has been in that regard! This is definitely doable and I'm actually having fun learning how to cook a different way - although I admit, I do like to cook on most days. Last night I even made my own spinach tortillas! Granted, it was for just the two of us and you are cooking for a large family. But baby steps, my friend, and give yourself a whole bunch of credit for the giant steps you have taken towards better health for you, and for your family. They will thank you for this for a variety of reasons down the road. great deal of fun. Good luck with the site.